​Reed’s Precision Machine (RPM), located in picturesque Logan, Utah, is the epitome of a family run business that continues to evolve. Reed Bindrup, who turned 85 as we went to print, started the business nearly a half century ago, in 1968. Though he plans to slow down some time in the future, he still comes to work at the business each day for about 8 hours! You can immediately appreciate the work ethic Reed installed in his family. The company is exceeding industry statistics for family-run businesses; according to The Family Firm Institute, only about 30% of family run businesses survive into the second generation, and 12% are still viable into the third generation. Not only is RPM surviving, it is thriving. ​​Sons Shawn, Brian and Dave grew up in the business, and they bought Reed out more than 20 years ago. (Shawn and Brian are close in age - just 18 months apart, and brother Dave is a few years younger.) Shawn’s wife Tiffany and his four sons are integral members of the RPM team, and though Brian and Dave’s children are younger, they are now beginning to participate in the business when they are not in school. From the small shop that Reed opened for business with two machines, a manual mill and a lathe, RPM has evolved into a world class manufacturing entity with the latest in technology. It is housed in a 30,000 square foot facility, and it employs a team of 38. The company provides high-quality parts delivered on time, at competitive prices. In their words, “We have the resources, in machines and manpower, of a large manufacturer with the flexibility of a small job shop.” ​​Some of RPM’s customers formally rate them, and they are an ‘A’ supplier in quality and on-time delivery. Their quality department is staffed with 2 full time inspectors who are able to check parts with the most rigorous tolerances, using their state-of-the-art CMMs, Optical comparators and gages. ​All 3 Bindrup owners are not just experienced machinists — in fact all earned their degrees in Business/Production Management from Utah State University. Today, each brother specializes in a specific area of expertise, and their roles all include business management (front office), customer interaction (sales), and machining, which they continue to do on a daily basis. It isn’t often that a small manufacturing entity specializes in both machining and fabrication, but this is exactly what RPM does. They offer Mill, Lathe, Weld, Saw, Laser Etching and fabrication, all done in house. They can manufacture both metals and high technology plastics, which Shawn says are used by their medical, food processing and electromechanical component customers. RPM also supports customers in the automotive, aerospace, and industrial industries. And while the majority of RPM’s customers are located in Utah, they support customers throughout the Western United States, in CA, AZ, ID, WY, NV and MT, and they even ship products to customers in Ohio and on the East Coast. ​RPM offers the newest generation of milling techniques and processes. In addition to skilled machinists, the company has a very high accuracy 5-axis machine, a horizontal machine, and traditional 4-axis and 3-axis vertical machining centers that are great for prototyping and for production. The company utilizes the best in software to run the business, including: MasterCam, SolidWorks, CAD Systems, MCOSMOS CMM Software and JobBOSS. The Bindrup owners are all advocates of education, and they draw from the engineering program at their alma mater, Utah State, to bring in new talent and to support training of our next generation in manufacturing. The company also offers its employees the ability to go to school for ongoing training, at RPM’s expense. ​The 3 Bindrup owners recognize the importance of regularly investing in new machine tool technology for their customers. 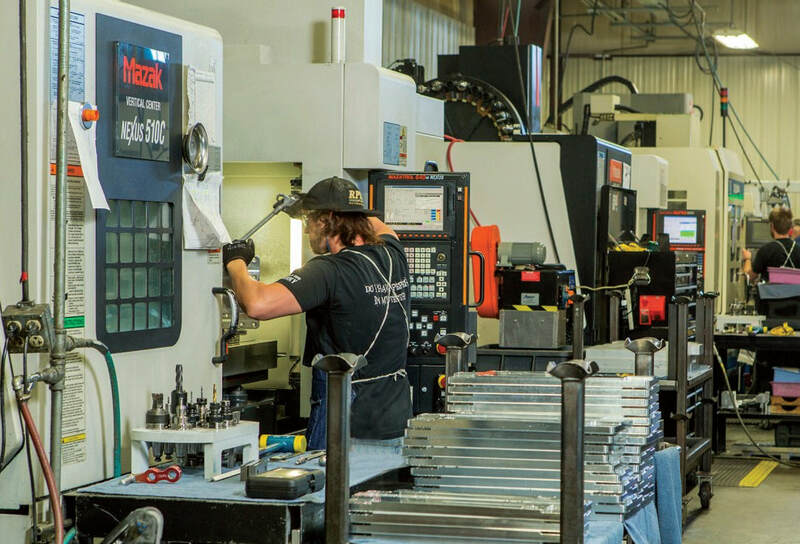 Their CNC milling capability is impressive– with 15 machining centers, including a Mazak VARIAXIS 500-5X, a fully integrated 5-axis VMC with a 2-pallet changer system. Last year RPM added their first horizontal machining center, a Mazak HCN-5000-III and, in less than a year, they added a 12 station Palletech Manufacturing Cell to this machine. The Palletech system allows RPM to have parts/fixtures ready to go, and allows for extended unattended operations. Also, just this last month, they added another Mazak VCN-430B-II. ​RPM’s customers are a testament to their business. Here is what just a couple have to say about them. “Reed’s Precision Machine is one of the premier machine shops in Cache Valley and in the Intermountain area. Their expertise is matched by very few others. When I order parts from Dave Bindrup and his excellent staff, I know without a doubt that the parts will be accurate when delivered. Besides the quality that always comes with their products, the entire office staff and machinists are always friendly and extremely helpful. When our needs are urgent, RPM always comes through when we need them to.” Mark W.
“As Purchasing Manager for one of the top roller coaster and amusement ride manufacturers in the world, I have worked with Reed’s Precision Machine for the past 13+ years. Reed’s is one of our #1 machine shops that we use for a variety of parts; both for new projects, as well as spare parts orders for existing customers. Reed’s is always willing to do whatever it takes to meet our very tight delivery schedules, while maintaining the utmost quality. They continue to provide us with the most competitive pricing and the highest quality parts and service. I would recommend them to anyone.” Daniel T.